a performer, poet, painter, musician, mime, stylist, actor, artist, dancer, set and costume designer, writer, pop star, androgynous style icon.....have I forgotten anything? Let's just call him a Renaissance Man, shall we? It was my birthday last weekend, and my gift to myself was a trip to Toronto to see the David Bowie Is exhibit at the Art Gallery of Ontario, and visit with a couple of friends. I've never considered myself a die-hard David Bowie fan - when I was a teenager, he wasn't even on my musical radar. However, over the last 20 years, I have grown to appreciate his wide-ranging talent, seemingly endless ability to re-invent himself, and his creative and flamboyant style. I am the proud owner of a vinyl copy of Diamond Dogs, complete with gatefold sleeve (you have to be a certain age to know what that means). The exhibit, which debuted at London's Victoria and Albert Museum last Spring, contains more than 300 items selected from David Bowie's personal archive, including photographs, lyric sheets, sketches, paintings, costumes, books, album covers, letters, even a mugshot from his 1976 arrest and the keys to his Berlin apartment. The technology used in the exhibit is mind-bogglingly impressive. Viewer wear headphones that are triggered by sensors in various parts of the exhibit that allow them to listen to music videos, concerts, and interviews. One room of the exhibit is devoted to excerpts from his films, another to his music videos, and the last room in the exhibit is a high-ceiling-ed, multi-media temple featuring footage from various concerts. One could easily spend several happy hours surrounded by Bowie's sound and vision (see what I did there). Signs in the exhibit prohibited photography, so I discreetly defied the rules in order to bring you the photos below, so don't report me, ok? Costume worn during an appearance on Saturday Night Live in 1979 in which he performed "Man Who Sold the World". The stiff, bowling pin-shaped costume restricted Bowie's movement so that he had to be carried on and off stage by his backup singers, Joey Arias and Klaus Nomi. The exhibit is at the Art Gallery of Ontario until November 29th and is scheduled for further stops in Berlin, Sao Paulo, Paris, and Chicago. See it if you can. absolutely amazing!, I've never been a huge fan of Bowie, but I remember his so fascinating presence and fabulous video clips and attires! !, Glad you've enjoyed all that fabulousness and so interesting clothes and music and images!! Incredible style - that man has it. Thanks for breaking protocol to deliver the goods! I love that frock coat! OMG!!! 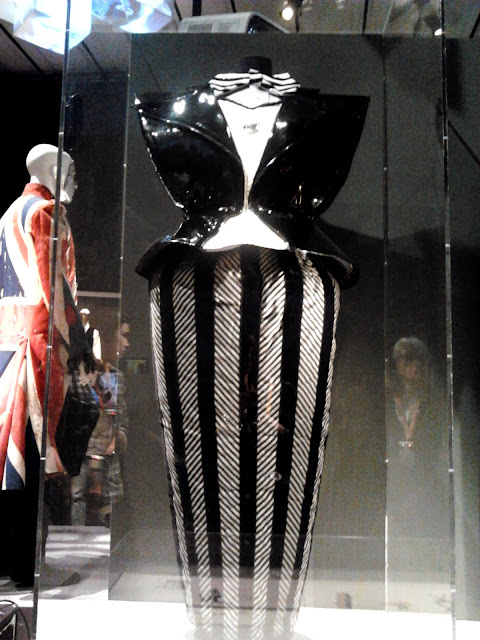 What an amazing exhibition!!! I do like Bowie,he really has been such an innovative and incredible talent over the years. Respect. His glam period will always be my favourite, those costumes!!! O, I wish we could have that exhibition down here, I'd love a close inspection!! I'm glad you were rebellious and snapped some furtive pics, Shelley - they're wonderful! 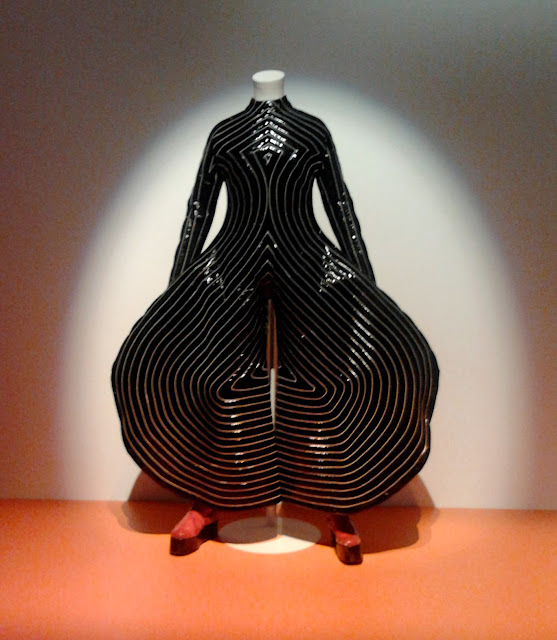 What brilliant costumes, the Aladdin Sane and Man Who Sold The World outfits are art. 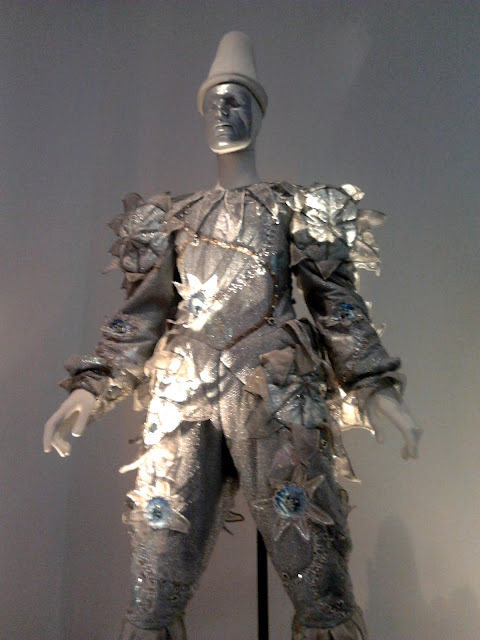 And I have a huge soft spot for Ashes to Ashes, only Bowie could make a Pierrot costume look cool! Oh, I would love to see this - no chance in my corner of the world. I adore the frock coat (it sings to my steampunk-y heart). I must start planning for my 50th now. Sorry Shelley, i didn't wish you happy birthday- Happy Birthday to coolest Gal in Ontario! Did i tell you how much i love your Docs! A million times i suppose, oh! btw got an e-mail from Doc Martens, they have a new web site- Warehouse sales! did you get it? they have that pair of black biker's boot! What a neat exhibition and you sneaked some pics, you were lucky not to get caught! But i salute your sneakiness! Great pics Shelley! He was not my music radar as well, but he's got some good music! I saw the exhibit last week too. It was so packed, hard to move around. Very interesting. Managed to see both the David Bowie and Ai Wei Wei exhibits a little while ago - a very good day at the gallery indeed!! 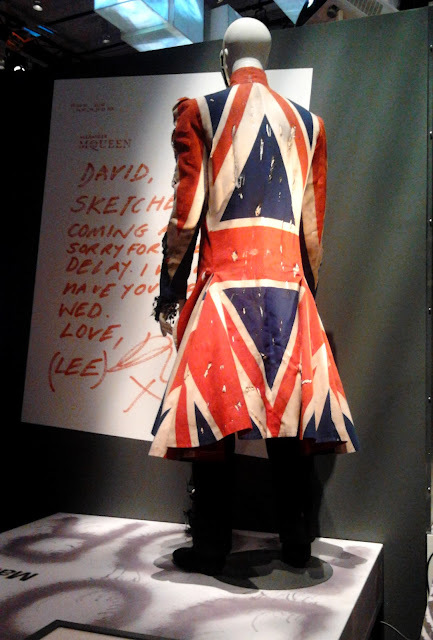 Would have been great to go back thru the Bowie show during the week when it wasn't so busy - so worth a second visit. Great pix BTW, and happy belated birthday! Hey there, I really like your blog and I hope that maybe we could follow each other on Bloglovin and/or GFC, Facebook? That man is a true artist. I love Thorne Garnet's comment. Bwa-ha-ha! David Bowie is amazing!! Thanks for sharing this with us! Dear Shelley, Happy belated birthday! How could I have missed it. 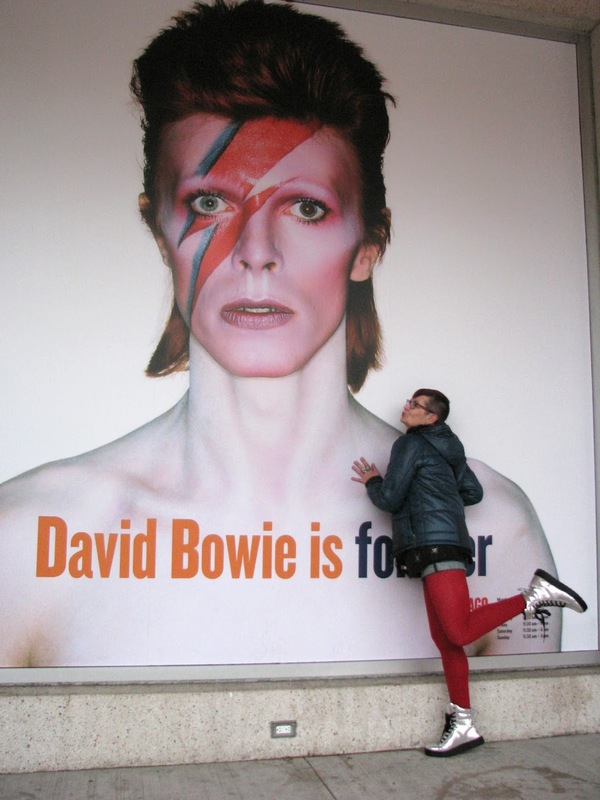 Celebrating at the David Bowie exhibit seems the perfect thing to do for a woman who has limitless creativity. The costumes are breathtaking. 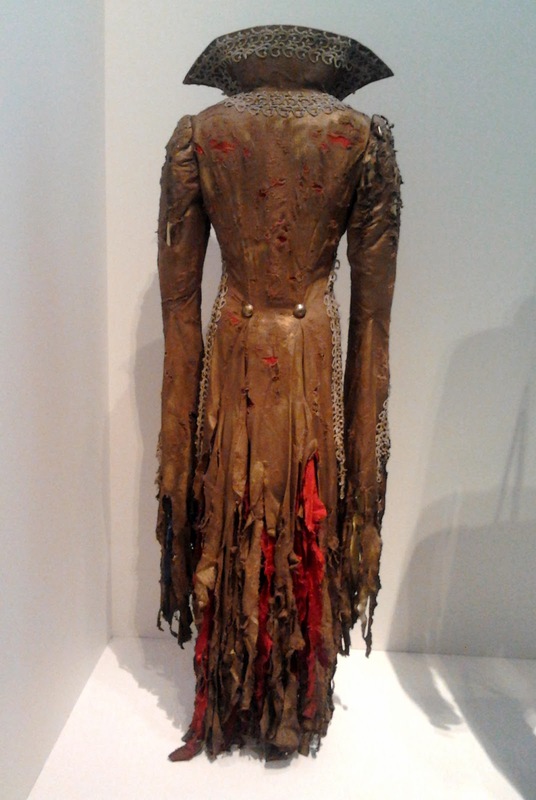 Wouldn't it be fun to wear the tattered frock coat? I can see it on you in my mind's eye. Report you? I want to hug you? I saw him in concert when I was 20 years old, which was...uh, a long time ago. But he's still HOT.